Walking around the house on a sunny Sunday afternoon, surveying the mess, picking up, planning to make new messes, thoroughly distracted. I look down to check in with Zella, all snuggled in the carrier in hopes of keeping the cranks at bay. 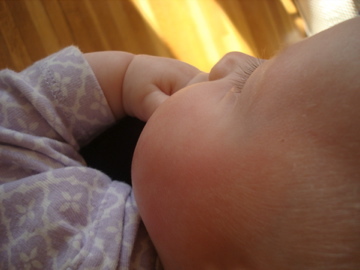 She had found her fingers and lulled herself into a happy sleep. So incredibly sweet that I just had to get the camera and try to capture it from my vantage point. This entry was posted on Monday, April 6th, 2009 at 12:42 pm	and is filed under Misc.. You can follow any responses to this entry through the RSS 2.0 feed. You can leave a response, or trackback from your own site. That is one cute baby! Nice work! Such a pretty baby! And this is especially cute when you scroll to the top of the page and see the banner with Dash sucking his thumb. Must be siblings! That is so sweet! And what a pretty baby!